Mamelodi Sundowns new signing Phakamani Mahlambi and coach Pitso Mosimane. Bafana Bafana international Phakamani Mahlambi has signed a five-year-deal with Mamelodi Sundowns. Mahlambi moved back to South Africa after spending a season in Egypt with Al Ahly. The Bafana Bafana forward became the first South African to play in the Egyptian Premier League when he joined the Red Devils from Bidvest Wits. 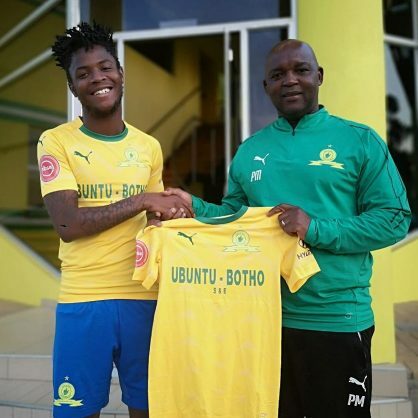 Mahlambi comes into Pitso Mosimane’s squad as a replacement for Percy Tau who players in Belgium for Royale Union Saint-Gilloise.